The Princess Theatre has a remarkable history, almost dating back to Melbourne’s foundation. Originally an equestrian amphitheatre, the Spring Street site was extended and remodelled in 1857 by Australia’s theatre impresario of the time, George Coppin, and opened as The Princess Theatre and Opera House. Ownership of the theatre changed on an almost annual basis, and underwent several more renovations – the most significant being in 1865, with everything other than the shell of the building rebuilt from scratch. Despite initial commercial success, the building fell into disrepair and closed on 3 January 1885. The Princess had a new lease of life due to The Triumvirate – a partnership of JC Williamson, George Musgrove and Arthur Garner – three of Australia’s most influential theatre practitioners. Construction took nine months (three months longer than scheduled), and at a cost of £50,000. The new Princess Theatre opened in 18 December 1886, with a performance of The Mikado. Designed by William Pitt, the building remains one of the finest examples of exuberant ‘Second Empire’ architecture, and contributes to the decidedly Victorian streetscape of Spring Street. Its marble stairs and foyer were hailed as equal to the Paris Opera, the Frankfurt Stadt and the Grand in Bordeaux. It featured the world’s first sliding or retractable roof, and state-of-the-art electrical stage lighting. The New Princess Theatre became renowned for drama, opera and ballet – a staple of entertainment for the next fifty years. It also became known for its most famous resident. Frederick Baker, known to the world as Federici, was playing the role of Mephistopheles in Faust. As he descended into ‘hell’ amid smoke and flame through a trap door, Federici suffered a heart attack and died on the spot. The cast, informed of his passing after the show, were in disbelief as they had all just seen him on stage for the curtain call! Federici continues to reside in the Princess, with regular sightings and mysterious occurrences. In 1901, the outdoor terraces on the first floor were enclosed with stained glass windows to create a Wintergarden Bar. Further renovations took place in 1922, and under the ownership of Benjamin and John Fuller and Hugh J Ward, the auditorium and façade were extensively remodelled. Columns supporting the Dress and Grand Circle were removed and replaced with cantilevered balconies, and the original shops and separate entrances to the theatre on Spring Street were converted into a foyer. The grand copper awning was also installed. Garnet H. Carroll took over ownership of the Princess in the 1940’s, and from 1942 to 1947, ran it exclusively as a cinema, due to the scarcities of World War II. After reverting back to live theatre, the Princess staged Gilbert and Sullivan operettas, dramas, comedies, and the new ‘musical theatre’ productions. During the golden age of Melbourne theatre in the 1950s and 60s, the Princess hosted Australian premieres including West Side Story, The King and I, and Carousel. In 1973, the Princess Theatre was listed by the National Trust, although by the 1980’s the theatre had once again slipped into disrepair and could no longer stage modern shows. 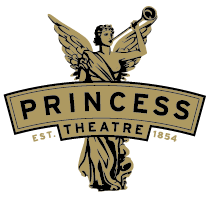 In 1986, David Marriner purchased the Princess Theatre and set about planning its total refurbishment, ensuring its future viability as a live theatre. A complete historical study was carried out, which recommended the reinstatement of the 1922 design, as most 1886 elements had disappeared through regular renovation. Samples of original light fittings were found and replicated, and almost 2,000 paint samples were microscopically analysed to ensure an accurate reproduction. Work commenced to raise the height of the proscenium, remove the nineteenth-century stage equipment, construct a new fly tower above the stage, and install new bars and public amenities. Paintings and colour schemes were carefully restored, including the ‘colour glazing’ in the auditorium dome, in which the colours blend from a darker hue to a lighter range near the central sunburst. Painters were trained on-site in the special techniques, just as it was done in 1922. On 9 December 1989, the restored Princess Theatre reopened with great fanfare with the new production of Les Miserables. It was immediately followed by the blockbuster The Phantom Of The Opera, premiering in December 1990, which went on to smash box office records as the longest-running show ever staged in Australia. Since then, the Princess Theatre has been established as the home of musical theatre in Australia. Beauty and the Beast, MAMMA MIA!, The Producers, Guys and Dolls and Jersey Boys have all opened in the beautifully restored theatre, that has once again become one of Australia's most loved theatre venues.